Web designers come in three types: excellent, typical and poor. Just like any business the vast majority of web designers are typical, doing much the same as most other web designers. A small proportion is poor. They produce only average designs that anyone could do with a template, they provide terrible customer service and they charge a lot for a little. Meanwhile, of course, there are some truly excellent designers. These individuals have good business sense; they seek to help their customers and they have outstanding design skills too. So what does it take to be a great web designer? What kind of people should you look for if you want the best web designer for your project? Having worked with several designers over the years, I have noticed that the good ones all do the same things. Here are their seven habits. The most effective web designers really understand you and your desires. They ask lots of questions, they spend a great deal of time talking with you about your business and your customers. You wonder when they are going to start designing. Great. That means they are taking considerable effort to understand your perspective, giving them a much higher chance of producing the right design for you. Companies often think they understand the online market for their business when they might be guessing. In order for your website to truly work and for the design to be effective it has to target precisely your online market. Effective web designers do not begin their work until they have undertaken market research so that they understand who you are trying to reach. A website only works if it has a desired outcome. There are far too many websites that look great but have no goal in mind other than getting visitors. An effective web designer wants to know what your website is intended to achieve so that can be built into the design approach. Even young designers who have been brought up with electronic design software resort to pencil and paper to sketch out their ideas. They do this because they get a much greater sense of feeling as to what design is likely to work best. True, there are some designers who never use pencil and paper. But ask the designers who produce award-winning websites; most of them will sketch out ideas on paper first. There is research that shows that our brains are more engaged when we use a pencil (or pen) and paper. Writing or drawing with our hands produces more mental activity than using keyboard and software. Effective web designers instinctively know this and use pencil and paper to start with. Wire frames are designs of a web page that have nothing other than boxes on them showing where each element of a page will be. What this means is you are not distracted by colours or by dummy text or actual design elements. Instead, your mind focuses on the overall look of the page and how it will function, which is the most important thing. Effective web designers know this and will show you wire frames first. Effective web designers appreciate that even though they think they have produced a fantastic design, the target audience might not agree. So they test the design, they get audience feedback and they are prepared to change and adapt their designs according to the information they receive. Your website is the heart of your online business. Effective web designers appreciate this and realise that their response to anything to do with your website is fundamental to your business. As a result, they respond rapidly to your calls and emails. They don’t quibble or argue. They always smile, even if they think you are a numpty. The go above and beyond what you expect them to do. Effective web designers realise that their business depends not upon their brilliance in design, but upon how well they treat you. 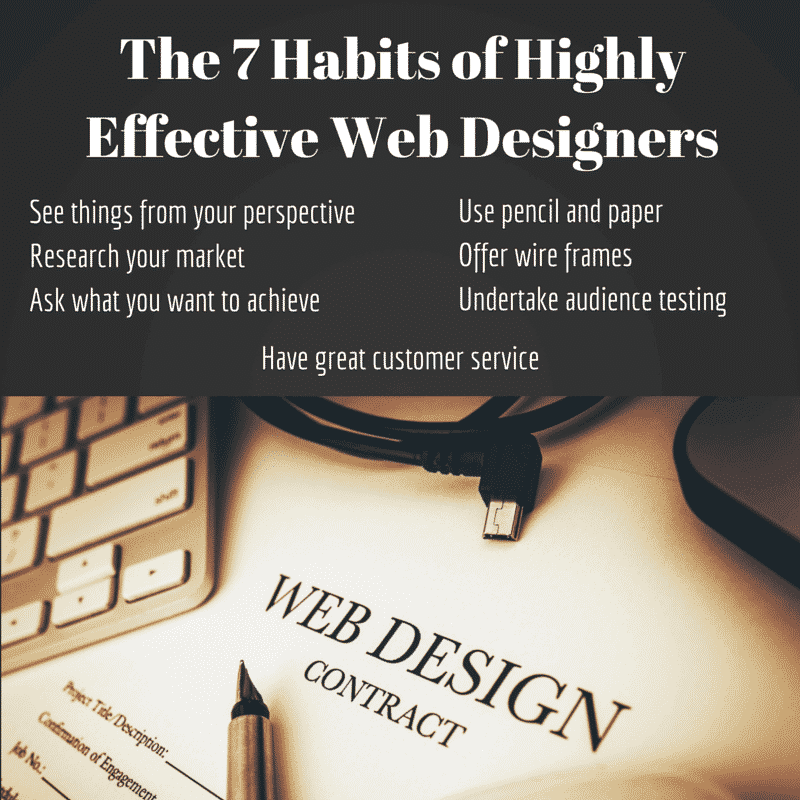 So, there you have it, seven things to look out for in web designers. The web design companies that do these things tend also to produce fantastic looking websites. It’s actually a nice and helpful piece of info. I’m happy that you shared this helpful information with us. Please keep us up to date like this. Thanks for sharing.